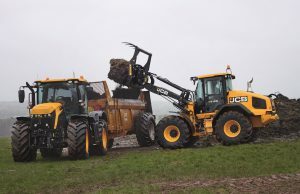 This year’s Grassland & Muck Event – being held May 24th and 25th at Stoneleigh, Warwickshire – will see the UK launch of the all-new JCB 419S Agri high-performance wheeled loader. The new JCB 419S Agri replaces the current 418S Agri with increased power and torque from its 6.7-litre Cummins six-cylinder engine. Peak power is increased 5% to 136kW (183hp) and the engine now meets latest emissions rules using only an AdBlue injecting SCR system and DOC – no particulates filter is needed. The new levels of power and torque are channelled through a ZF six-speed powershift with a low first gear delivering exceptional pushing performance and torque converter lock-up in all gears giving unrivalled silage clamp-climbing ability. Yet the JCB 419S Agri can also travel on the road at up to 48kph, enabling it to keep pace with other machines in a contractor’s silage-making or manure spreading team. An all-new front and rear chassis design, longer wheelbase and bigger axles enable larger tyres to be fitted for greater traction and/or flotation on soft surfaces. In fact, the 419S Agri can run on the large 750/65 R26 tyres fitted to the flagship JCB 435S Agri. The new axles are available with limited slip differentials front and rear to help maintain traction when conditions get slippery underfoot; and a new auto locking diff can be installed on machines likely to operate in especially challenging conditions. A load-sensing piston hydraulic pump with up to 180-litre/min capacity ensures strong but economical performance from the front end, which can be equipped with Standard and High Lift loader arms for maximum break-out performance or lift height clearance as appropriate for different applications. Load-over height ranges from 3.48m to 3.71m and the 419S Agri has a full-turn tipping load of almost 6.9 tonnes. JCB wheeled loader operators moving to the newcomer will find the CommandPlus cab is 15% bigger than the previous design, with improved visibility and control and information features that establish new levels of operator comfort. CommandPlus Control provides in-cab daily service checks – so operators can get their machine up and running sooner – as well as in-cab adjustment of auxiliary oil flow, the speed at which the optional boom suspension engages, and timing intervals for the auto-reversing engine fan option to suit different conditions. An integrated remote camera display is also available. These all help the operator to exploit the loader’s performance with the help of new joystick and multi-lever hydraulic controls, both of which feature a thumb-operated shuttle switch and provide proportional control of all loader functions. The newly-updated JCB 413S Agri, the new 419S Agri and the 435S Agri will all be in action at the Grassland & Muck event to demonstrate the performance potential delivered by their unrivalled power-to-weight ratios, six-speed torque lock-up powershift transmissions and high output hydraulic pumps.